Arkadiusz Milik (left) celebrates his goal against Cagliari. A stoppage-time free kick from Arkadiusz Milik gave Napoli a 1-0 win over Cagliari on Sunday to keep them eight points behind Serie A leaders Juventus and end the Sardinian team’s unbeaten home run. ???????? The Pole’s perfectly struck free-kick secures Napoli the victory in the 91st minute! Napoli coach Carlo Ancelotti made six changes to the side that lost to Liverpool on Tuesday, sealing their elimination from the Champions League, and left out key players like Marek Hamsik, Dries Mertens and Lorenzo Insigne. 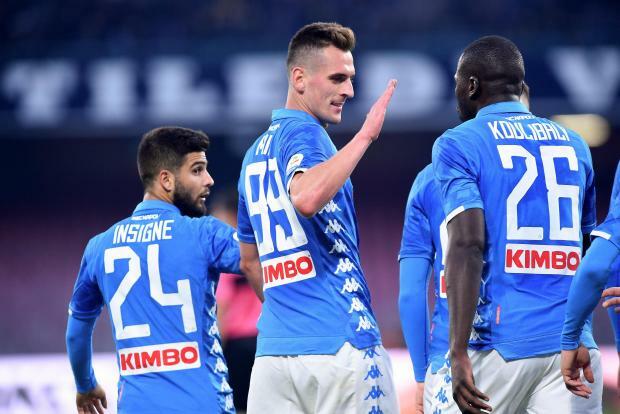 He was almost left to rue his decision as his side struggled to break down the home side, but Milik’s 91st-minute strike, the Pole’s seventh goal of the campaign, made them the first team to defeat Rolando Maran’s side at the Sardegna Arena this season. Diego Farias headed over for the hosts before Milik’s header came off the underside of the bar and bounced back into play, but the striker made amends when he swept a left-foot free kick sweetly into the top corner. Napoli remained second in the standings, six points clear of Inter Milan, with the gap to Juventus remaining at eight points following the champions' 1-0 win over local rivals Torino on Saturday. Cagliari remained 13th place on 17 points, six clear of the relegation zone. Earlier on Sunday, Fiorentina ended a 10-match winless run with a 3-1 victory over Empoli in the Tuscan Derby and Sassuolo recorded a 2-0 win at struggling Frosinone to move into the Europa League places in sixth. Fabio Quagliarella was on target for the sixth game in a row as Sampdoria beat Parma 2-0 to climb to seventh, and in the lunchtime game SPAL and Chievo played out a goalless draw that kept the latter side rooted to the bottom on four points.